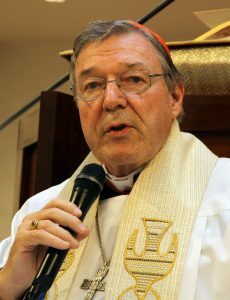 The trial, conviction and sentencing of Cardinal George Pell is a tragedy. It’s a tragedy for the victims who fought for decades to be heard. A tragedy for those who didn’t live to see justice. A tragedy for those in the Church whose work and faith carrying out the true teachings of Jesus has been tainted and betrayed by this awful, ongoing saga. And the trial cuts to the very heart of Australia’s legal system. The decision to broadcast Cardinal Pell’s sentencing hearing is a divisive one. Understandably, many in the community see the public airing of his punishment as just; a public humiliation warranted after so much silence. Some in the media are calling for our courts to be opened up, for trials and convictions to be televised. That’s a terrible idea. It would undermine the foundations of our judicial system. Here’s why. Australia, as we know it today, is a relatively young country. We were lucky in that we could look to the other great experiments in democracy around the world and take their best ideas. It’s how we came to adopt the “Washminster” system; the best of Britain and the USA blended in to one system. And it’s a system set up to keep politics out of the courts. Over the years, very little has changed with regard to how our courts work, especially in criminal trials. You’re innocent until proven guilty beyond a reasonable doubt. The courts can keep certain things suppressed to protect your presumed innocence and guarantee a fair trial. Judges are appointed by expert panels on the endorsement of their peers, usually because they were exceptional lawyers with outstanding track records of fair and honest dealing. Photographers and cameras aren’t allowed into most courts. There are many reasons for this, but mostly it’s to protect the independence of proceedings and ensure the accused and their alleged victims can’t be identified. To the person on the street, it seems like “justice” happens behind closed doors, but that’s only half true. Most courts are open to the public. You can attend most hearings and see the courts in action. Judgements and what the Judge said at sentencing are all available publicly. You can access them from the internet and read them, along with many court transcripts, for free. Yes, it’s frustrating that “justice” isn’t on TV, but compare Australia to the United States, where things are very different. In the USA, courts have become a spectacle. Most courts are televised. About 87% of American judges are elected. The same goes for criminal prosecutors. Immediately, that changes how a court works. No longer is justice blind, but beholden to election cycles. Judges and prosecutors want to look good for their voters. They want to be re-elected, and so they play to the people at home who’re watching from their couch and throwing popcorn at the TV whenever the villain appears like some bad, suburban pantomime. Sentences are harsh, even for minor crimes, and judges famously throw the book at people because they know it plays well to their base. Our courts are boring, but they work. I’d much rather face a judge whose only concern is the quality of evidence being presented, rather than how things will play out in the ratings. The system isn’t perfect, but it works.